After working in an office for day and night and being a great employee, we fail to receive promotion. Promotion is the way of which an employee is getting a hike in his / her gross salary and his / her place in the office. Whenever someone applies for a promotion he/she expects that his / her hard work to pay off in the form of a promotion. An employee gives his/her 100% into their job to make sure that an employer will consider them for the position as well deserved. Sometimes even after working so hard on promotion their application for promotion gets rejected for certain reasons. So while facing that rejection people tend to lose their temper and patience over the conversation. Therefore, here are certain ways to handle rejection over promotion. Once given the reason of your promotion rejection, one may feel a little cranky over such situation. To avoid such unfamiliar situation and feeling, it is always better to be calm enough to handle it. Never allow one’s anger take over one’s actions because anger never solves a problem, it only makes it worse. Being calm and accepting the rejection gracefully is a better way to handle it. And if there is a rejection of one’s promotion then there will be valid reason for it too. 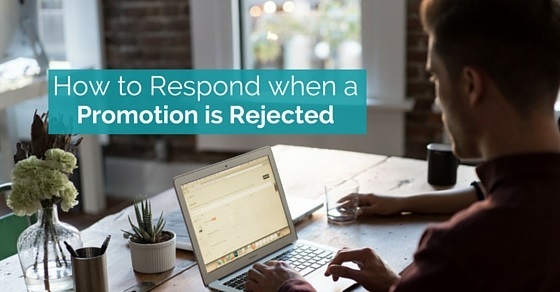 After applying for the promotion if a person gets rejected of his / her promotion, then at that point of time that person needs to calm himself and try to approach an employer with positive manner and request for the reason over rejection. This kind of gesture may turn one in a better position. Instead of demanding an explanation an employee can politely request for a reason for it. Sometimes because of one’s rejection over promotion which one expected after being overconfident will turn him/herself in a negative way. Sometimes rejection seems a little hard to understand without any proper reason for it. Instead of taking this rejection so hard on oneself, one can at least try to control his / her emotions so that there won’t be any further damage over one’s career. Rejection of promotion may turn us angry over people who didn’t consider them for that place. After facing the rejection, one may feel a little irritated over the decision, then one can always try to communicate with an employer once he / she in a calm state of mind. This kind of behavior may let him / her understand the real reason for his / her promotion rejection. After working so hard for so many years and even if one fails to get that particular promotion then there will be a valid reason for such rejection. To understand the rejection one needs to understand the reason behind such rejection. After validating the rejection a person should move on and work even better until he / she get that promotion. After one receives a rejection over his/ her promotion, there will be certain negative people who may influence in a negative way. They may give certain reason for rejection in a personal sense. And this will turn yourself into that negative assumption mode where one can only get influenced by negative thoughts. At the end it will turn one negative over the situation. To avoid that one can seek positive influence over his / her rejection. Once a person faces a rejection over his / her promotion gets more angry over the situation and may behave in a way that it will turn them in a negative zone. To avoid such problems a person can start taking his /her rejection in a positive way so that he / she can easily move on out of the rejection. Sooner a person gets out of that zone better that he / she would handle it. Never hold on for anything which is not yours and give a shot over life with different dimension. Receiving a rejection will be tough enough to digest, but not impossible. This kind of self-determination will help him /her to grow and make them stronger enough to face it. Instead of grieving over something which was yesterday, it is better to focus on one’s future goals and activities. Self determination can turn over one’s negativity into positivity. To avoid extreme reaction over rejection, one needs to understand the reason behind it in a positive way. And start taking work seriously. To do that, track one’s previous work so that one will understand the flaws he / she was doing. This will understand them to end such mistakes in future and will boost them to work better. By discussing one’s doubts over work will help one to improve. One can always ask an employer to give one a performance review over his / her work. This kind of performance review will help one to improve their flaws in their work and lets them understand the way of delivering such work without any problem or issue in the near future. Being honest and positive about one’s work will let you grow better and wiser. In an office there are several employees and all never be honest with their work. This may turn their chance to get promoted, but sometimes this kind of dishonesty with work can cost them more. One’s honesty regarding one’s work will take them achieve higher goals. Setting new future goals will divert one’s ambition to take a turn in a different direction. What if a person doesn’t get promoted to that post he / she desired for, there will be plenty of opportunities other than that place in an office. May be one can achieve higher place than this particular position. Rejection can make one strong enough to face the problem. One needs to learn a lesson from one’s rejection over promotion. This rejection can be considered as a driving force for one to work hard enough to achieve one’s goals. It also can help one to improve on skills and talents to showcase their talent in a better a manner. Therefore, to take a rejection in a positive way one need to learn a lesson from it. After rejection over promotion one needs to understand that it is not the only and last chance to get that promotion. There will be situations where one’s confident work is noticed by several and even be appreciated. By this kind of confidence over one’s work will make feel positive about their working way and will let one to appreciate his / her own ability. If the reason behind one’s promotion is not valid and the person received promotion was well deserved candidate, then it may feel like unfair to others, but instead of being caught under rage it is better to take a step back and plan one’s move. To deliver that one needs to highlight their performance by taking initiative to present it. Instead of going low on one’s self esteem, one can jump up one step ahead over the working ability. There may be certain reason when a person gets rejected of promotion and following are some of the reasons for it. An employee who takes time for granted and always be late to the office will not be able to get a promotion because of one’s bad timings. A person who really want to earn his / her promotion at least work for minimum hours of work. If an employee works very hard and doesn’t value time, then there won’t be scope for his / her promotion in that office. An employee with average skills and ability will never be able to get promoted. A higher authority comes with higher responsibility, if an employee fails to understand his / her current work, then there won’t be any scope of his / her future goals. Earning a better skill and management ability to do it, is an essential reason for getting promoted. An employee with a poor performance will never be able to get shot at promotion. To earn a promotion one needs to work so hard on their duties and responsibilities. If one fails to deliver quality of work then because of his / her poor performance a person loses his / her chance over the promotion with better pay. If an employee shows a very laid back attitude towards his / her work, then that particular person never be able to get a promotion. Good attitude over one’s work shows his / her interest in the work. If a person shows a negative attitude towards his / her work, then it never can help him / her to get a chance over the promotion. Even a person with good behavior over his / her work can be considered to be able handle promotion. But if a person shows very bad behavior over his / her work that person will never be able to handle promotion and even never get a chance to apply for promotion. If a person works day and night without worrying about time, one have dedicated his / her life over one company may deserve to avail a promotion. But the problem occurs when that particular hardworking person fails to communicate it with the employer. This kind of communication difference can cost him / her their promotion. A person can get rejected by his / her promotion application because of their low interest over work. To meet a goal one needs to have such drive to push to that level. But because of some reasons that particular person is not working hard as compared to the other employees. An employer always tries to motivate their employees as much as possible, but even after such encouragement some employee doesn’t give the company their 100% over the work. If a person doesn’t commit him / herself to the work they’re doing, then there won’t be any positive result of such work. If a person commits themselves to work hard enough to get a promotion, then the outcome of such commitment towards work is resulted in a promotion. A person needs to work with a team, but sometimes what happens that a person in a team doesn’t agree with the rest of the team decision and because of this kind of misunderstanding, the company can face loss over it. A main thing to work in a team is to think like a team and have to learn to adjust their egos. To end this discussion, we would state that if a person loses his / her chance over promotion, it doesn’t mean that they won’t be able to get a promotion later. There surely will be one day that he / she can have a shot on his / her promotion. An employee who expects a certain kind of appreciation over his / her work in the form promotion should deliver best performance for the company. Therefore, instead of being negative and behaving badly with another employee on rejection over promotion, one can at least try to be calm and handle the situation in a better way. Behaving over the rejection may turn things so bad that one can lose his / her chance over promotion permanently by receiving the termination of duties.